Tonpei-yaki is a kind of Okonomi-yaki made of sliced pork side and eggs. Mixing the grilled pork into the pancakes made of eggs and flours, after grilling that, we eat it with worcester sauce, green laver, and Katsuobushi (dried bonito shavings). The volume of Tonpei-yaki is light in comparison with Okonomi-yaki, it’s good for Otsumami in izakaya. Further, Tonpei-yaki has the other variations, mixed shredded cabbages and green onions or be more likely to omlet. If you are sterving, you can add the noodles in Tonpei-yaki to have the volumes up as you like it. 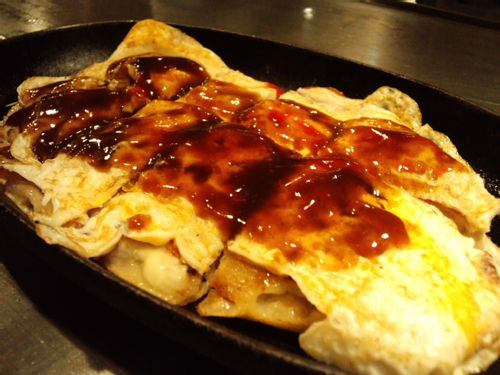 Tonpei-yaki is popular only in izakaya, it is not suitable for Okonomi-yaki and Tako-yaki in eminence. I sometime order Tonpei-yaki, but I don’t have special impression of that. But the taste of Tonpei-yaki is not worse than them, so please try it if you’re interested in.